Last time we talked about the power of our words and we asked ourselves “What are we naming things?” Today, we’re going to discuss another important principle. Are you ready for principle number two? Have you ever noticed how easy it is to get focused on the things your loved ones do wrong? I believe one of the most common reasons is wrong focus (thinking) or self focus (thinking). 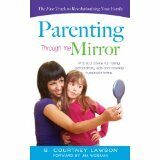 Most parents realize that their kids are a reflection of them, and if their kid looks bad, they look bad. This may even be at a subconscious level. In any case, this can make you focus on the 10% of their behavior that’s wrong instead of the 90% of their behavior that’s right. Let’s call that the 10/90 Principle. Its the little voice in your head that’s screaming, “You’re making me look bad with that 10%.” Here’s the problem with that. Whatever you focus on becomes the focus. It gets bigger. While you can’t ignore disobedience, and we’ll hit that one at a later date,. you need to focus far more of your energy on encouraging and coaching them in what they are doing right. There are already enough sources telling them everything they do wrong. Besides, when we focus primarily on what they do wrong, it creates a defeated spirit and can ultimately lead to rebellion. When we focus on the 90% right, the 10% usually self corrects. So make a choice to affirm what they do right daily and tell them. Here’s an assignment: Pray and ask God to show you all the great qualities in your child, or your spouse for that matter, and then make a list of them and thank God for them everyday. It will reprogram your thinking and get you out of this rut. Decide to implement the 90/10 principle today! Early on we had a revelation that our children were going to become who we were, not who we told them to be. and that our influence would be directly proportional to our obedience. We were in agreement that we wanted to raise our kids God’s way. So, we dove into the Word, especially Proverbs, and soaked it in . . . we were clueless, all we knew is if the Book said it, we’d should do it. Proverbs 22:6, really stood out to us. As we studied, we began to see our job as not regulating but coaching and training. Over the years, we adopted these principles into our parenting and they were huge, so I want to pass them on to you over the next few weeks. God shows us his intentions for mankind in the Book of Genesis. He had just finished creating virtually everything. He did not need any help, yet he assigned Adam the creative task of naming all the animals. Here God gave us the “Name It Principle” (The principle of creation.) Remember, we are created in His image just like Adam. Whatever Adam named the animals, that’s what they were called. God was teaching the created how to create. This is the same principle that God used when He created everything. When He gave it to Adam, He gave it to us. The same opportunities, vastly different results. It’s the way you think that makes the difference. It all starts with a thought. And realize, sometimes it is not the direct words you speak, but how your child filters what you say that makes it reality for them. You’re the head and not the tail. You are made for greatness. What you focus on (think about), and what you say is what you get. A thought gives birth to words, and words give birth to actions. It’s the principle of creation at work. So why do we sometimes speak words that kill instead of words that give life?